You know, I think one of the worst things about moving over, and over, and over again is how many things you lose. There are the things that just take a walk and never show up again. There are the things that get packed in the wrong box so the only way you will ever find them is by accident (just this week, I found a folder with birth certificates in it while I was looking for pieces to a Halloween costume. Yeah, nice.) There are the things that just don’t get unpacked. And then there are the things that were misplaced before your house got boxed up and could be…anywhere. I always throw a little party for myself when I find one of those things. Almost four years ago I made Max and Charlie some hats. And I meant to publish the patterns, really I did, but I got distracted, and then they got lost, and we had twins, and we moved, and we moved again. This week I ran across the hats and decided to look for the notes one more time (this is NOT the first time I have tried, believe me) and they were there. Pretending they had never gone anywhere at all. If you want to buy the patterns, you can get them, because I’ve finished and published them. Here’s Pip (the stocking cap) and here’s Pep (the one with pompoms.) If you’re going to buy them don’t forget your coupon code! Okay, time for the funny story. When I made the hats, I named them Pip and Pep. The reason that I named them that is because when I was a teenager, making lists of names for my future children (…uh, you did that too, right?) I came up with a set of names for twin boys. And those names were Peregrine (nicknamed Pippin, like in the Lord of the Rings) and Pepin, after the father of Charlemagne. Pippin and Pepin. I thought it was cute. Obviously, my tastes have changed since then – thank goodness – but when I knit those two hats I thought it would be fun to make a private reference to the names. The funny part is that this seems to have unleashed some sort of teenage-daydream-voodoo, because a month after that post I became pregnant with twin boys. COINCIDENCE? I THINK NOT. Finally, I wrote a silly little poem to go along with the patterns, but I couldn’t find a good place to work it into the pattern pages, so I’m going to make you read it here. 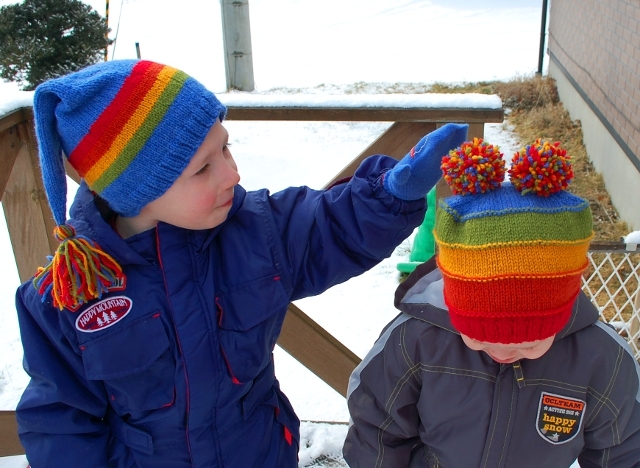 I have two boys, they have two hats. I knit them both – one round, one flat. One has big stripes and two pom-poms! That either will be met with glee. They are great fun, and that is that! Go check out Pip and Pep for more pictures, and I hope you enjoyed my funny story! Hi just found your free crochet patterns thank you! I am also LDS and live in Suffolk in the UK. I loved reading about you and your lovely family I will let you know if I successfully crochet the pattern. Love following the American race for the Presidency very exciting to see an LDS member in the race glad I do not have to chose from the 2 of them they both seem like such good men!